We’re proud to announce DeepCrawl’s latest partner integration and another fantastic addition to your Search Universe: the Majestic API. When someone links to your site, the link equity from their site flows through to yours, and these incoming links also indicate to Google that your site is relevant and useful for users which helps to improve your rankings. This means it is crucial to have a good understanding of the number of backlinks that are pointing into your site, and how they are distributed between your pages. We have been working on our backlink capabilities and the data we provide to make sure they are as useful to our customers as possible. Initially, we were offering a manual upload option for a combined view of backlink and crawl data, which we improved to accept the CSV formats from all the industry-leading backlink tools. Manual uploads for backlinks are helpful, but true to their name, you have some manual work to do to upload them which can be time-consuming. You also have to generate these lists of data on an ongoing basis and periodically upload them to get the freshest data. We have partnered up with our friends at Majestic, and are now giving our customers a free backlink data layer. You don’t need to have a Majestic account in order to make the most of this feature, we’re throwing in backlink metrics to combine with your crawls, free of charge! The URLs we return back to you are prioritised based on the number of linking domains each one has. This means the list of pages with backlink metrics will always be your most linked to pages. What Metrics Can You Get from the Majestic API? Our new Majestic integration allows you to see how well-liked and well-linked the content on your site is. From now on when you include Majestic data in your crawls, we will pull through linking domain counts and backlink counts for your pages. You will be able to see the total number of backlinks a page has across your site through the use of crawl data. This will be another important way of gauging the importance of your pages. We’ve made it straightforward for you to add backlink metrics to your crawl, and the integration is a one-click process. 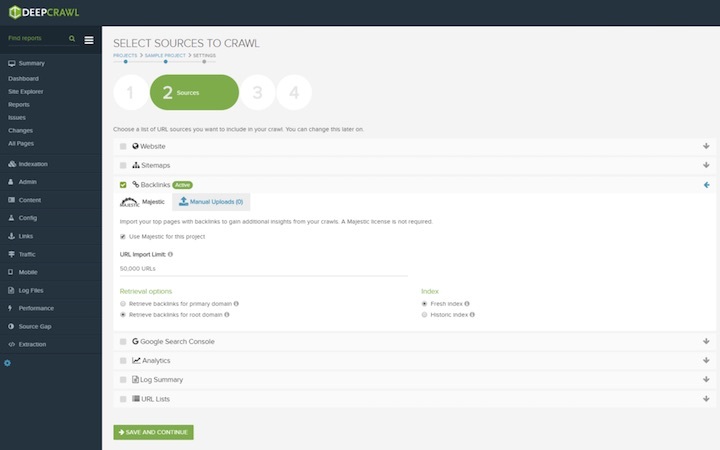 You’ll find the option to include Majestic data in the second step of the crawl setup where you manage your crawl sources. Here you can also do some customisation, such as setting the number of pages you want backlink metrics for, and choosing to get the highest backlinked pages for your primary domain only or all subdomains. You can also choose whether you want to use Majestic’s Fresh Index or Historic Index. We use the Fresh Index as default as this is a more accurate and up to date view of all links within the last 90 days, but you can delve back further into your site’s past with the Historic Index if you’d prefer. With this additional Majestic data layer you will be able to map out where link equity comes into your site and how it flows through, and implement fixes to plug any leaks in equity along the way. Not only can you make sure that your highest value pages are receiving links as hoped, but you will also be able to see your lowest value pages that are getting links, and where link equity is being wasted. With Majestic backlink data integrated, you’ll be able to see 4xx/5xx pages, pages with meta nofollow tags and disallowed pages that are receiving links where authority from those links cannot be passed on to the rest of the site. These pages are the metaphorical leaks you can plug to make sure link equity is ending up where you want it. To see how to plug them, take a look at our detailed guide on how to monitor and fix your backlinked pages. By combining this view of your backlinks with Google Analytics data as well, you will also be able to see how many users are following dead-end backlinks to pages which now have a 404 error, and make the required fixes such as implementing redirects. You can also cross-reference pages with backlinks against pages within your sitemap and indexed pages to make sure there are no technical issues which could be preventing your most popular pages from being submitted to Google’s index for further users to then see, take value from and link to. We hope you enjoy this latest feature, happy crawling!